The Selle Italia SLR Tekno is an extremely lightweight saddle although its lack of padding makes it feel firmer than most so it has to fit you very well if you're going to stay comfortable on longer rides. The SLR Tekno's main selling point is its weight. Ours hit the scales at just 96g (Selle Italia claim 90g). You could reasonably say that anything under 200g falls into the lightweight category, sub-150g is superlight, and below 100g is nuts. The upper is carbon-fibre with no padding at all, and the 7mm x 9mm rails are CarboKeramic – high modulus carbon fibre with a resin that contains ceramic particles, according to Selle Italia. They reckon this allows them to lighten the weight compared to standard carbon rails while adding strength. The Tekno is very similar in shape to a standard SLR. That's my favourite saddle in the history of the universe, so that's a great start. The main difference is that rather than being quite flat across the top, the Tekno slopes slightly downwards from the centreline to the sides in the rear section. Like most other SLRs, the Tekno is 275mm long and 131mm across at its widest point. The nose is fairly narrow. It tapers along its length and measures 40mm across at about the midpoint. The shape suits me really well which is why I use an SLR as my everyday saddle. If you don't get on with the shape perfectly, forget it. The fact that there's no padding here means there's no chance you'll get away with a saddle that's not quite right. How do you know if the shape is suitable for you? If you've not used an SLR before, head to a Selle Italia dealer http://www.selleitalia.com/idmatch_dealers/europa/index.php and go through the idmatch system to determine the best saddle for you. http://www.selleitalia.com/en/idmatchsystem/ It's a simple (and painless!) process that involves measuring the distance between your ischial tuberosities – your sit bones – your thigh circumference and pelvic rotation. It takes just a couple of minutes. As you'd probably guess, the lack of padding makes a significant difference to the feel of the ride. A small amount of flex in the upper – not much – dampens vibration and softens bigger hits but the ride still feels firm and you're reliant on a good seatpad in your shorts for cushioning. I've used saddles without padding before and not made it around the block before standing up on the pedals and vowing never to sit down again. They looked uncomfortable and felt worse, resulting in the shortest rides I've been on since I was six years old. Things were different with the SLR Tekno. I couldn't say this is among the most comfortable saddles I've ever used but it's far from the least comfortable. It feels firm but I could live with it easily enough, especially when used on a bike with a fairly flexible 27.2mm diameter seatpost. I wouldn't relish doing a big weekend ride using the SLR Tekno – I'd rather have something with padding and a bit more flex for that – but I know of people who rack up 100-milers on this saddle and think nothing of it. Personally, I'd save it for race day. 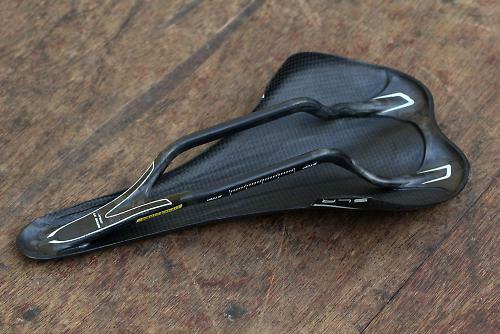 I'd certainly use it for a crit or a short road race where weight is a more important factor than long-ride comfort. Okay, you might be saving just 100g or so over a regular saddle, but if you're a weight weenie focusing on marginal gains it all counts. One final thing to bear in mind is that if you tend to slip forwards on a normal saddle, you'll probably do that more so here because the surface is so smooth and glossy. Oh, and one final final thing: that £300 price tag. Now, that really is uncomfortable. Selle Italia say: When light weight meets incredible strength, that's the SLR. With attractive Italian style and an innovative carbon fibre stucture, SLR remains the last word in racing saddles. If you aren't careful when leaning your bike up it's fairly easy to scratch the surface although this is cosmetic. There's no padding to provide comfort so it comes down to the shape, which I find spot on, and a small amount of flex in the shell. It's one of the great ironies of cycling that it cost you more to get less (96g in this case). Value isn't this saddle's biggest selling point. I found the SLR Tekno much, much more comfortable than any other padding-less saddle I've ever used, but I'd struggle to use it for long rides. I mean, I could, but I'd prefer a padded saddle. That means that for me it would be a race saddle only, although some people would be happy to use it all the time. The weight, the stealthy looks, good comfort, especially considering the lack of padding. Did you enjoy using the product? I got on with it surprisingly well. Would you consider buying the product? Would consider it but for the price. This is crazy money. Saddles hit the deck in a light fall from leaning against a wall will get ruined. £300 for a peice of carbon fibre.. Please support a chinese fake and send spend the money elsewhere. We might be identical arse twins. My spoon is very nice & a tenth of the price. I was riding a stripped SLR across London (20 miles each way) for a while. I survived a few months, but my unmentionables did take a bit more of a battering. So, I've down-graded at the expense of a little over 200 g. Considering the bike weighs in at a mighty 12 kg, I think I'll stick with comfort.